A motorcyclist is fortunate to have only received minor injuries after he collided into a car which was reportedly turning into a lane on the Philip Goldson Highway yesterday morning. The incident took place at Mile 4 near the Benny’s Apartments where, according to eyewitnesses, the motorcyclist – who was driving a white and burgundy motorbike – suffered serious abrasions to his body after making a failed attempt to overtake the car – a silver Nissan Altima, which was in the process of making a left turn, across the opposite lane. The front portion of the driver’s side of the car was subsequently damaged, while the cyclist –identified as Noel Leal, Jr., 29, of Buttonwood Bay in Belize City – was violently hurled into the air, reportedly landing some 30 feet away. 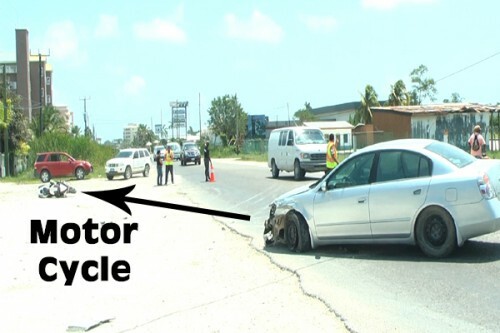 Both drivers were apparently heading into Belize City, and eyewitnesses claim that the female driver of the car – who was unhurt – had put on her signal to indicate that she would be going left. However, the cyclist, who was allegedly traveling at a high speed, apparently did not notice the signal, and so slammed into the turning car. According to police reports, about 11:19 a.m. on Tuesday, they proceeded to Mile 4 on the Philip Goldson Highway and observed the silver-colored car, being driven at the time by Charlett Danes Castellanos, 29, of Ladyville, with extensive damages, and a Yamaha 1000CC motorcycle on the extreme right shoulder of the road, also extensively damaged. Police said that initial investigations revealed that both vehicles were travelling on the Philip Goldson Highway from the direction of Ladyville to Belize City when upon reaching the area in front of the Benny’s Apartments, Castellanos attempted to change direction into Reimer Feed Mills’ parking lot, and as a result, caused Leal, Jr., the motorcyclist, to collide with the front left driver’s side of the Nissan Altima. Leal suffered multiple abrasions to his hand, legs and feet, and was taken to the Medical Associates via ambulance, while Castellanos has been served with a Notice of Intended Prosecution.